A deadly mistake in an otherwise routine crime for Brikken Motorcycle Club puts an eight-year-old girl in front of Chief. Just why Chief steps up to become Johanna's guardian escapes his reasoning, nor has he wasted time trying to find an excuse beyond protecting a child's innocence from the club's criminal activities. He only knows that when he looks down into her sweet, innocent face full of curiosity instead of fear, she moves him. Her eyes are more expressive, her personality more addictive, than anything he's ever experienced. Johanna fills a void inside of him in a way that being president of Brikken, the son of Rollo, the leader of hundreds of the roughest men, fails to satisfy. And so, he plants Johanna in his life. He provides and gives, and makes her feel special. She isn't only his taste of freedom from the hard life he lives, but his spring, summer, fall, winter. She becomes his breath of fresh air in a world where betrayal, enemies, and a knife in the back can happen at any moment. 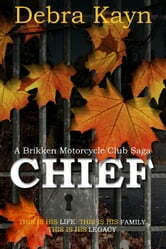 Through building Brikken Motorcycle Club and continuing his father's legacy, Chief deals with heartache, incarceration, secrets. Determined not to repeat his father's mistakes, he creates and manipulates the world around him, including those he permits into his life. He does everything for Brikken. For his sons— Jett, Olin, and Thorn. For Johanna, the child, the woman, who makes it all possible. Johanna's earliest memories center around a big man who picks her up, changes her life, and the way his beard tickles her skin. At a young age, she learned there are two kinds of people in the world. Those who love forever and those who love—or maybe can't love—and leave. Her mom left her with strangers. Nene sent her away. Karla would eventually push her away. But, from the moment Chief walks into Johanna's life, he promises to stay. No one has given her the comfort, security, and pleasure that she fearfully needs, until Chief. Through the tribulations of her childhood, the awakening of her womanhood, and a new world filled with bikers, she learns to survive on promises, trust, and the love of one man, through the biggest struggles of her life.